I would absolutely love one of these to keep my, ah, “home movie” collection on. 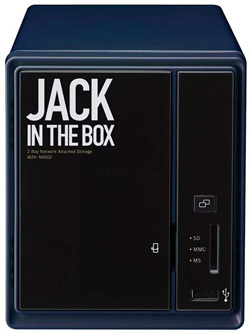 Jack In The Box MZK-NAS02 is essentially a NAS with two SATA bays plus a dedicated Bit Torrent client built-in. Using a web-based interface, you can control the Bit Torrent and NAS functions easily, allowing you to pirate 24 hours a day, 7 days a week from any location in the world. Jack is capable of RAID 0 or 1 arrays and supports hot-swapping drives. Have a speedy internet connection in your home office? Take advantage of it by using Jack’s Gigabit Ethernet connection or add your own media via the SD/MCC card slot on the front of the device. Now before you clean your saliva up, pick your tongue up off the floor etc., we should warn you that Jack In The Box is currently Japan only and there is no official US release date in sight. The expected cost for the device is around $333 and no word yet on if you’ll be able to easily import it.